Nestled inside St. Louis' Victorian jewel, Tower Grove Park, the Vernon W. & Marion K. Piper Palm House is a popular upscale host for weddings and parties with its high glass ceilings and lush array of vibrant greenery. 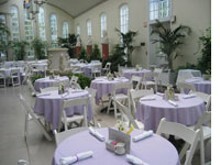 Inside the Palm House, park visitors on Sunday can relax with brunch at Café Madeline. The French-inspired menu features an omelet station, soups, salads and a changing list of entrées. Fresh orange juice, coffee and mimosas are available to round out the dining experience, along with the café's namesake dessert. Reservations are strongly recommended and should be made well in advance on special holidays.